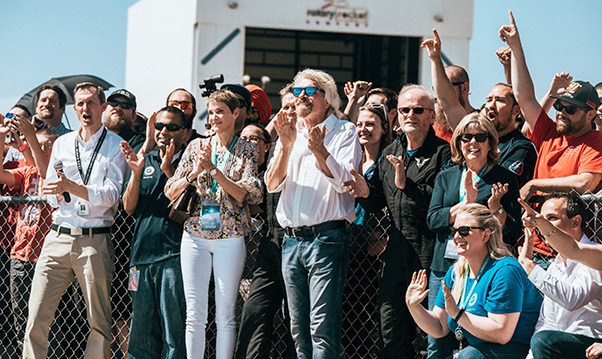 Sir Richard Branson joined Virgin Galactic and The Spaceship Company teams May 29, on the Mojave Air and Space Port flight line, to witness VSS Unity’s second successful, supersonic, rocket powered test flight. The focus of today’s flight was to expand understanding of the spaceship’s supersonic handling characteristics and control system’s performance with vehicle parameters that were closer to the ultimate commercial configuration. This involved shifting the vehicle’s center of gravity rearward via the addition of passenger seats and related equipment. The rocket motor burned for the planned 31 seconds and propelled Unity to a speed of Mach 1.9 and an altitude of 114,500 ft. As will be the case for future commercial flights, Unity’s unique re-entry feathering system was deployed for the initial descent before the final glide home to a smooth runway landing. Once in commercial service, Virgin Galactic’s spaceships are designed to be turned around and flown at a higher frequency than has traditionally been the case for human spaceflight. The flight today brought that vision a little closer, coming less than two months after Unity’s first rocket powered flight. “Great credit goes to the engineering and maintenance teams for working through the first flight’s data diligently and efficiently before preparing Unity again for flight,” said a company spokesperson. Richard Branson Welcomes VSS Unity Home from Second Supersonic Flight, May 29, 2018. Branson was on the runway tarmac to greet this flight’s VSS Unity pilots Dave Mackay and Mark “Forger” Stucky. In addition to the pilots of VSS Unity, Branson recognized CJ Sturckow and Nicola Pecile, the pilots of the carrier aircraft, VMS Eve. While in Mojave, Richard Branson also toured the facilities of The Spaceship Company, Virgin’s Galactic sister company. TSC is focused on manufacturing next generation aerospace vehicles, with a primary focus on new spaceships for Virgin Galactic’s future fleet. Branson viewed the next two spaceships on the TSC’s manufacturing line, as well as the production facilities for TSC’s spaceship rocket motors.